Shut down the opponent and stop every shot. Only The Complete Soccer Goalkeeper will show you how to combine awareness, technique, and physical conditioning to anticipate the opponent’s every move. The Complete Soccer Goalkeeper also includes advice from leading goalkeepers, analysis of many of the game’s stellar saves, and exclusive insights from today’s top attackers on the defensive weaknesses they try to exploit. 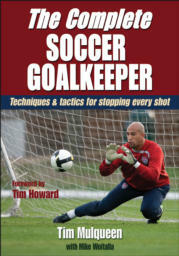 From tactics to strategies, The Complete Soccer Goalkeeper is simply the most complete guide available for players and coaches of the game’s most challenging position. NOTE: This book was submitted to our website and is not an endorsement by Soccer-for-Parents. To check out the book further go to Amazon.com . Join in and write your own page! It's easy to do. How? Simply click here to return to Submit a Soccer Book Review.